*Twenty athletes between the age of 18 and 29 underwent a randomized double-blind, placebo-controlled, human gold standard trial at Wingate University School of Pharmacy with results proving that Magnum Rocket Science® increased mental focus and memory, athletic performance, endurance and energy. N. Conley, Wingate University School of Pharmacy 2013. 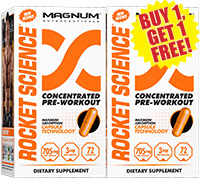 Due to Magnum’s pairing of both the highest quality Pharmaceutical Grade raw materials and the most cutting edge ingredients available, Rocket Science® will blow you away from the very first dose. The Java Shock™ blend ensure maximum caffeine absorption with zero stomach upset allowing for a much smoother experience along with longer, more sustained energy. BrainStim Serum ™ is the twisted proprietary formula that cranks happy energy levels through the roof while also narrowing focus down to a pinpoint. Beta-Phenylethylamine, L-Tyrosine, Dendrobium Nobile, L-Theanine, Hordenine, Citicoline and Vinpocetine are all combined in exact measurements to correctly activate each other and produce rapid and sustained energy throughout your muscles and nervous system. 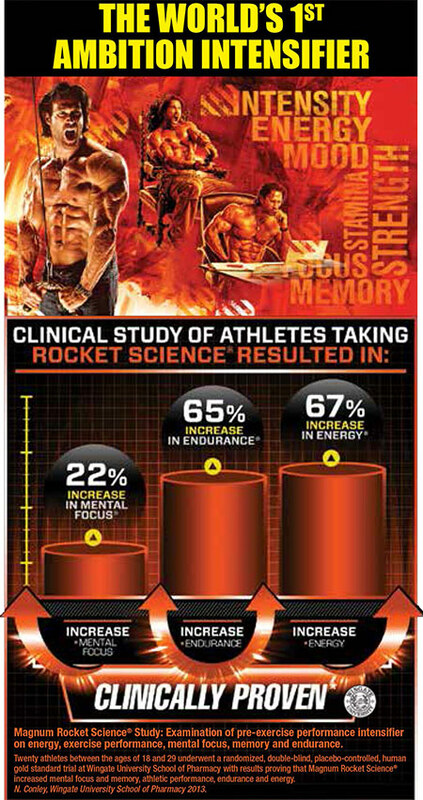 Rocket Science® also enhances overall brain metabolism, increases ATP production and blood circulation improves, which helps to increase oxygen uptake and glucose metabolism in the brain. 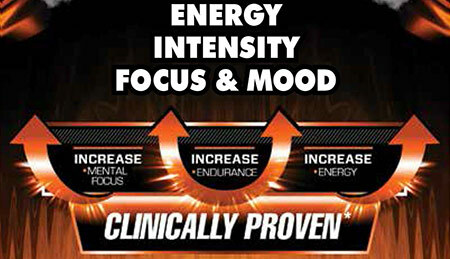 Many users also note an improved level of mental energy, allowing the athlete to remain focused and alert. 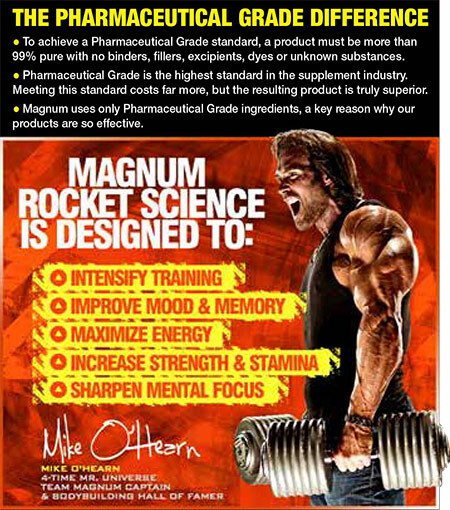 WARNING – ROCKET SCIENCE® CAN CAUSE INCREASED BRAIN RAVES! Caffeine Anhydrous acts as a central nervous system stimulant, reducing physical fatigue and restoring alertness when drowsiness occurs. Its ability to produce increased wakefulness, faster and clearer flow of thought, increased focus, and better general body coordination has lead it to be the world's most widely consumed psychoactive drug. Dicaffeine Malate is a mix of caffeine and malic acid. Beyond all of the benefits of caffeine mentioned above, the addition of malic acid calms the digestive effects of caffeine and also replenishes the energy produced by the caffeine. Beta-Phenylethylamine is an organic compound and a natural monoamine alkaloid, a trace amine, also the name of a class of chemicals with many members well known for psychoactive drug and stimulant effects. If correctly activated (see Hordenine below), PEA produces a state of bliss without a crash. L-Tyrosine (S)-alpha-Amino-4-hydroxybenzenepropanoic acid is a nonessential amino acid that is a building block of protein. It's part of the chemical reactions in your body that create the neurotransmitter dopamine and other hormones. The main effects of L-tyrosine that have been reported are acute effects in preventing a decline in cognitive function in response to physical stress such as weight training and other forms of exercise – this allows the athlete to remain focused and alert. Dendrobium Nobile 10:1 Stem Extract is a member of the orchid plant family and is one of the 50 fundamental herbs used in Traditional Chinese Medicine. Dendrobium contains powerful alkaloids that activate dopamine release, which is central to mood and cognition. This stimulates physical strength, energy, mood and mental focus. L-Theanine (Gamma-glutamylethylamide) is an amino acid and a glutamic acid analog primarily found in tea (Camellia sinensis), which has the ability to cross the blood-brain barrier, creating psychoactive properties. Theanine has been studied for its ability to reduce mental and physical stress, improve cognition and boost mood and cognitive performance in a synergistic manner with caffeine. Hordenine (N,N-Dimethyltyramine) is a mild short acting CNS stimulant that causes a release of norepinephrine. It’s also a highly selective substrate of MAO-B and acts as a temporary reversible MAO-B inhibitor. Because hordenine crosses the blood brain barrier it is able to inhibit MAO-B enzymes in both the body and brain. Hordenine is highly attracted to MAO-B enzymes, but doesn't destroy them, instead it temporarily ties them up, allowing other weaker MAO-B substrates like Phenylethylamine to pass through unaffected and be fully activated. Citicoline (cytidine 5'-diphosphocholine) is a psychostimulant/nootropic. One of the main benefits of Citicoline is that it increases the level of Acetylcholine within the brain. This is a neurotransmitter used to communicate between your neurons that plays a vital role in the development and formation of memory and a number of other cognitive processes. With Citicoline use, overall brain metabolism is enhanced and blood circulation improves, which helps to increase oxygen uptake and glucose metabolism. Many users also note an improved level of mental energy. This leads to an increase in attention span, focus, and concentration as well as greater amounts of motivation and vitality. Vinpocetine (3alpha,16alpha)-Eburnamenine-14-carboxylic acid ethyl ester comes from the periwinkle plant. Vincamine is extracted from periwinkle and an alkaloid extract of vincamine becomes vinpocetine. Vinpocetine is a natural substance that is effective at increasing memory, mental focus, and blood flow to the brain. Vinpocetine increases ATP production and the utilization of glucose and oxygen in the brain.